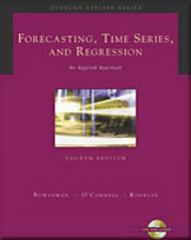 Forecasting, Time Series, and Regression (with CD-ROM) 4 Edition Awarded Outstanding Academic Book by CHOICE magazine in its first edition, FORECASTING, TIME SERIES, AND REGRESSION: AN APPLIED APPROACH now appears in a fourth edition that illustrates the vital importance of forecasting and the various statistical techniques that can be used to produce them. With an emphasis on applications, this book provides both the conceptual development and practical motivation students need to effectively implement forecasts of their own. Bruce Bowerman, Richard O'Connell, and Anne Koehler clearly demonstrate the necessity of using forecasts to make intelligent decisions in marketing, finance, personnel management, production scheduling, process control, and strategic management. In addition, new technology coverage makes the latest edition the most applied text available on the market.